New Hope Women of Today: Happy National Volunteer Week! National Volunteer Week, April 12-18, 2015, is about inspiring, recognizing and encouraging people to seek out imaginative ways to engage in their communities. It’s about demonstrating that by working together, we have the fortitude to meet our challenges and accomplish our goals. It’s about saying thank you to all of the many volunteers that make our organization magnificent. 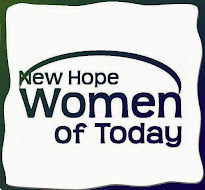 Thank you New Hope Women of Today for being you!